This week, with my mum here in Shanghai, we took a half-day trip across the city to the water town Zhu Jia Jiao. I’ve managed to get by for nine months referring to the town in a nonchalant jumble of Z sounds and a vague hand-wave (with any old tone thrown in for good measure), and this trip involved a full day of avoiding it like the plague, twisting my mouth into unintelligible Chinese when it was only explicitly necessary. Unsurprisingly, that was fairly often. It’s a speedy bus journey out of the city on the huge concrete flyovers that head south-west towards Shanghai province’s inland lakes and rivers, and the bouncy journey on China-style suspension is tempered only by the no standing system (I take a seated China-style snooze). ZhuJiaJiao is a different feel to Suzhou, with its Old Town constrained within a 15min radius of sharp, twisting alleys, packed with noisy sellers and nosier tourists, but in the blazing sun it certainly has its own charm – particularly in its two storey canal-side tea houses and restaurants. A maze of traditional wooden shutters, whitewashed walls, and dubiously constructed bamboo scaffolding that marked large-scale maintenance of it’s traditional architecture, the Old Town is a strange mix of the locals everyday life, adapted to the hundreds of camera-wielding tourists that march through every day between 9AM-5PM. After hours, I imagine, is entirely more pleasant. With a slow-paced wander around the Old Town, Mum and I get a noodle and wonton soup lunch upstairs in a quiet restaurant. I’d suggest checking out what the upstairs of your chosen lunch establishment is like before committing, lest you end up like us, with our windows bizarrely facing over the street and dry, latticed scaffolding instead of the picturesque tourist canal. By the end of the day, I did reluctantly learn to pronounce ZhuJiaJiao. You know, that pretty water town place, she says, gesticulating vaguely. In November, I made a long weekend trip an hour and a half from the Big City to Nanjing along with some girls here at Fudan University. The great thing about travelling with friends is that, even if things go a bit awry, any unfortunate catastrophe makes a pretty good anecdote when you’re putting your feet up at the end of the day. Come rain, dubiously timetabled buses, or our dodgy foreigner’s Chinese, we managed to power through a with a whirlwind tour of Nanjing. As a testament to the trip’s success, all six of us girls are still friends. Being November, it was drizzly, splashy and rainy for our second trip to the Jiang Su province, having been in Suzhou not long before. 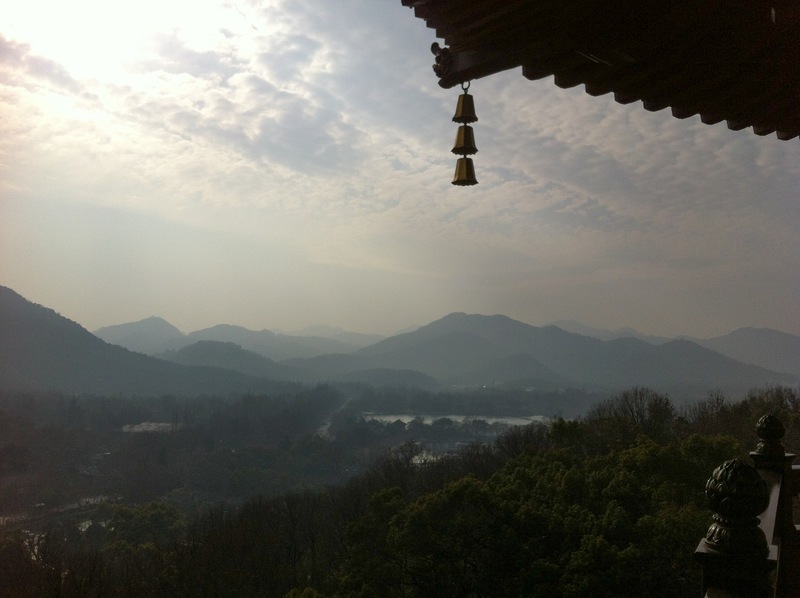 We made the best of our two day trip in Nanjing and split our time into a day on the Purple Gold Mountain tourist trail and a day for the City. It’s a long hike from the bottom of the mountain to base of the Sun-Yet Sen Mausoleum where a dizzying set of stairs lead the way to the memorial building, but the road is packed. 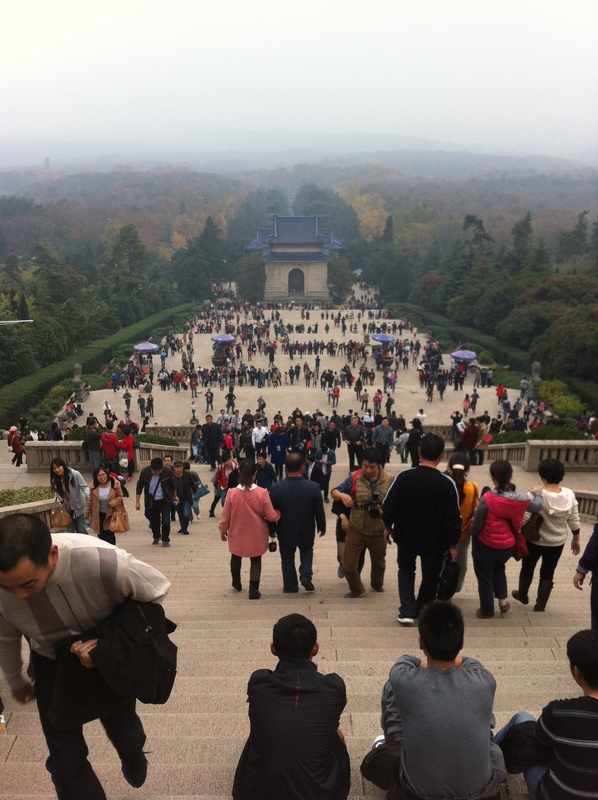 Nothing like getting overtaken by Chinese grannies on a crisp Autumn stair-master challenge. Although I may be some six thousand miles from home, something about the cool, clammy air in the mountains, the heavy foliage and falling leaves, walking with my backpack, and speaking English gives me the strongest feeling of home – of drizzling Northern Irish weather and Sunday walks with the family. 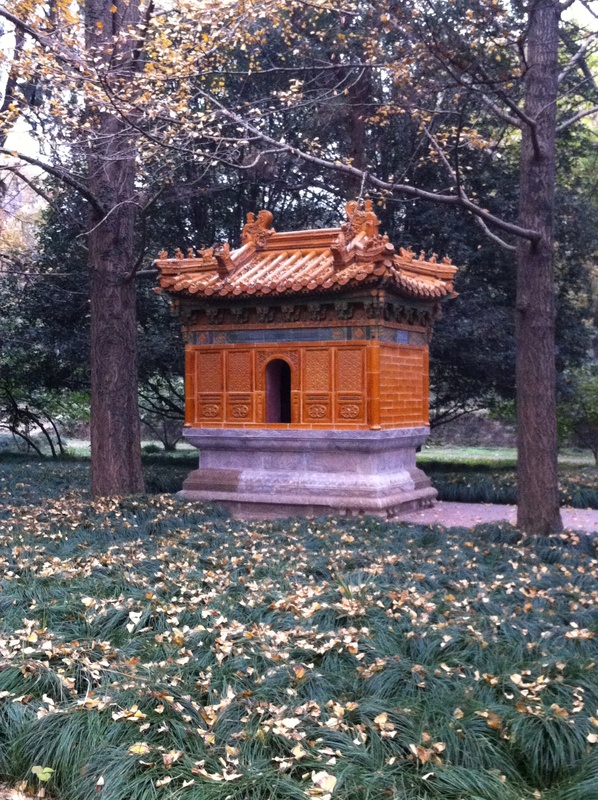 Purple Gold Mountain, though, has the most gorgeous yellow trees that line the paths and spray them with delicate, fan-shaped leaves, and now and then, we stumble across some Chinese architecture amongst the trees. Probably better than your average day Sunday walk. For our day in Nanjing City, the weather takes a turn for the worse and we head to the foreboding structure of the Nanjing Massacre Memorial Museum for the morning. It’s a dense exhibit, and here and there between it’s visceral images and personal accounts, tiny old men and women cry silently as they walk. It’s a harrowing visit, and by the end of it all, we’re a fairly tired bunch. Can hardly visit Nanjing without seeing this museum. At night, we take a jaunt around the intersection of Guangzhou Rd. and Shanghai Rd. for some post-touristing drinks, popping into Ellens, the local grimy Helen’s knock-off which is jammed full of local students, and quickly leaving to Brewsell’s pub round the corner for an Expat atmosphered beer (or Amaretto and Coke for me – the first I’ve seen in China). This fabulously dressed Germanic-looking gentleman sits at the bar, which probably makes my evening. In amongst our sight-seeing, there are a fair few exciting meals from the strange noodle breakfasts, the traditional lazy Susan lunches and, ashamedly, a desperation-fuelled Starbucks. Of course, my rucksack was constantly crammed with the odd snack to keep me occupied. As for sleeps, we nabbed a clean, six-person dorm, albeit slightly out of the way, in a hostel that featured smack bang in the middle of 1865创意园, a Creative Technology and Design Park. It’s been a while since I’ve had a chance to take a break and update on my travels here in China, but with the pesky Midterm Exams over I can finally take a look at the rainbow array of photos from my October trip to Suzhou! Snacks and drinks packed in my trusty rucksack and sunglasses at the ready. The Old area of Suzhou around 石路夜市场 ShiLu Nightmarket and its surrounding canals is a beautiful area of dainty Chinese bridges and street markets that sweep up out of the water in streets that weave alongside cloudy-watered, narrow canals. With it’s white and dark wood traditional buildings, cobbled streets and streams of red paper lanterns – the town Old Town sections are beautiful in the sun. As we make our way from the East of Suzhou town through the backstreets to the West, we criss-cross through silent, thin streeted residential areas (stopping for the odd 1.50RMB Green Bean ice lolly sold through a front door) and bustling open squared Pagodas where embarrassed tourists pose in traditional Chinese clothing and awkward couples shuffle in suits for wedding photos. We watch a man in his late 50s twist blobs of hot coloured sugar into beautifully delicate, edible animal shapes with some lickity spit and dubiously clean hands around the Temple of Mystery (which in itself is not that mysterious, and probably not worth the walk if the Temple is all you want to see…). Comfortable shoes an absolute must. Lunch, one of my three favourite times of day, greets us in the form of the famous hundred-year old Zhū hóng miànguǎn 朱鸿面馆 as we battle with the locals stopping off between work shifts, wrinkled and fresh-faced alike who fold over their steaming noodle broth bowls and inhale their juicy lunch. I try the recommended salty pork and noodle soup 香辣排骨面, 14RMB and exact sighs of exasperation as I take pictures of the chilli sauce bowl. In a refreshing, zesty break form Shanghai’s concrete forest, Suzhou markets are packed bursting with colourful flowers, tea-shops and stalls around the Suzhou Watertown Hostel area (苏州浮生四季青年旅舍). Besides a treat for the snap-happy photographer (myself), it’s also a sensory delight for anyone who loves nibbling at sweet street-food snacks (also me) as their speciality steamed desserts, candied fruit and sugar stewed lotus root are light, yummy treats that should keep most children (and easily satisfied twenty-one year olds) happy. Unfortunately, being peak holiday season, what we actually see is thousands of other tourists and energetic, flag-flailing guides, filing wildly and haphazardly in droves along the well-trimmed verges of the Humble Administrator (who certainly had a very big garden indeed). We become a garden highlight as we naively stop for a rest at this pagaoda, and are subjected to the flashes of Chinese tourists from all over the country. We do however, pose for this little girl who solemnly asks in perfect English if we would mind her mum taking a photo of her with us. As the sunlight sets over the Humble Administrator’s Bonsai’s we make for the end of our day-trip to Suzhou in a slightly mad dash back to the station after dinner. Taxi after taxi refuses to stop for the boys, who wave desperately at them. As the token Asian, I manage to hail one eventually (supporting our theory that some Taxi drivers are very suspicious of foreigners – actively avoiding picking them up) and we make it in time for our 40min train back home. It’s been a great day out, but I’ve got class in the morning. Off the High Speed Rail and into the bustle at Tianjin Railway Station. It’s autumn in China, and I recently made a trip out of the bustle of Shanghai up to Tianjin, where over the course of four days I managed to amass a large amount of photos of the journey, the city, and very few of myself and my friend Peter. In comparison with Big Ol’ Shanghai, Tianjin is pretty chilled and quiet city, and I’ve spent a lovely four days wandering some of it’s least tourist-trekked streets, thanks to my trusty guide, as well as some of it’s Lonely Planet-style tourist attractions. Despite the fact that Tianjin covers an area some six times larger than Shanghai, it’s population is only half that of the shiny southern city – and it shows. The streets are chilled, the metros are only quietly bustling, and the people are friendly (what a shock to the system). We start off the trip with an excellent 6¥ bowl of noodles at what Pete has dubbed ‘Man and Wife Pull Noodles’, a tiny, tiny, tiny restaurant that sits in a rickety road alley just by Tianjin Experimental High School. If you haven’t tried eating where the locals eat, you’re missing out on a real and genuine experience of China. This street is lined with lots of similarly miniature restaurants, all of which have been dubbed with fabulous English names by the local, non-Chinese speaking foreigners, and are flocked with tracksuited schoolkids at lunch (beware). I keep accidentally calling the restaurant ‘Man on Wife Pull Noodles’, much to everyone’s delight. Well, it is a bit of a mouthful. These pretty bottles are filled with Chinese vinegar, and are perfectly lined up on our table (one of only three, in a space smaller than my tiny dormitory bedroom at Fudan University). The decor has definitely happened by necessity, and not because they’ve popped down to the local Ikea. Oh, and here’s a Cat in Basket outside the shop. Why are you so grumpy, kitty! Next, I get the grand tour! Try the Tianjin Radio Tower, 1 Weijin South Rd, Hexi, Tianjin in summer for a great view of the surrounding city. On a smog-free day take the cheeky elevator up with a 50¥ Adult ticket (20¥ Consession/Student), and check out the span of the sprawling city. 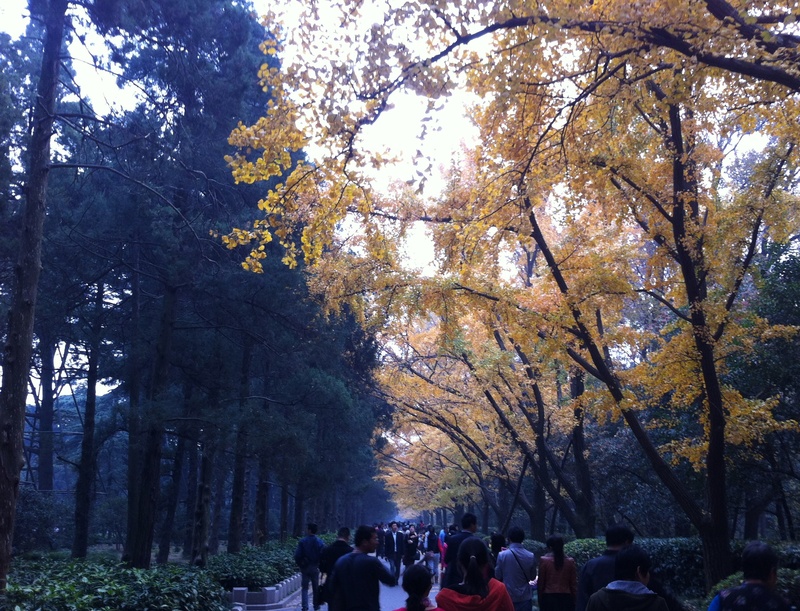 Afterwards, the nearby Lake Park 水上公园 is perfect for a relaxed stroll and watermelon on a stick! The attractions themselves are all a little worn out and dusty, with lots of attendants that seem to be there mostly for show – but worth visiting for the strangeness of it all. Other tourist spots worth a visit are the shiny, new Museum District, the Italian Quarter, the Old Town and the Tianjin Eye. Radio Tower in winter is an absolutely amazing sight. Tianjin is b-e-a-utiful in winter, if not horrifically cold. If you get a chance, go for a stroll around the local areas (or a bike ride if you can find one and are savvy enough not to get killed on raod that have a fairly relaxed attitude to general traffic laws). Out by Wujiaoyao the two story houses and residential streets are slow paced, and filled with wandering elderly people in faded floral packs; the wide, dry streets are sparsely tree-lined and seemingly under constant renovation, with building dust churning now and then under our shoes. Card playing old men in dark jackets shout in tense, tight circles around makeshift tables. We were very alternative, and took a stroll in the dark. One lovely evening after a long day at the nearby Italian Quarter and Old Town, we take a stroll down along the HaiHe 海河 Riverside to soak up some more of Tianjin’s relaxed atmosphere, take some photos, and a look at night-time life. A man and his daughter sitting in the glow of the Radisson Building. This man is taking the night shift on Tianjin Old Street very seriously. Three men fishing under an over pass; the man on the very left is wearing what’s left of his daytime, smart suit, while the older gentleman in the middle has the look of an old-timer to the trade. Little Eats Street, Tianjin is busy and bustling. Last man working the nightshift. Tianjin Clock in some pretty cool looking light pollution. “Home, James!” My family say this when we’re going home after a day out, but I don’t know why, or who this mysterious ‘James’ is. Peter made a face and sounded fairly insulted that I was calling him James… Does anyone else say this? Support would be greatly appreciated. Anyway, after a long day out, we nip on the last metro of the evening on line three and head home! 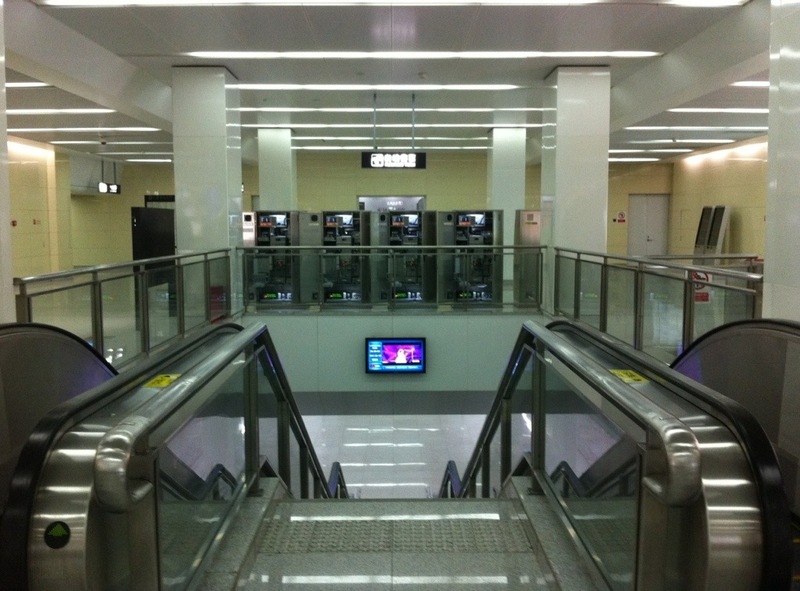 Tianjin’s metro is wonderfully efficient, and much less overcrowded that Shanghai’s rush hour. English everywhere and friendly staff makes it a super easy tourist city. I love how symmetrical everything is in the station, and as a treat, they’ve opened the backs of all the metro coin machines – pretty neat. At on my window seat back down to Shanghai as the High Speed Train hits 400km/h! It’s a long journey home when you’re leaving an old friend and heading back to a city that you can barely call home yet. It’s a seven hours door to door, and I do nothing more than doze, read and listen to music. It’s been great to take a step back from Shanghai and chill out for four days from the stress of university level Chinese and watch Pete make all our transactions, translate, tour guide and generally be an excellent host. On the creative side of things, one of the great joys of touristing with a friend is you don’t have to feel nearly so ashamed of spending five minutes trying to get the shot that you want. So cheers to the large album dedicated to one of China’s five national central cities. Oh, hey there Vogue, this is the Tianjin Railway station. Incredibly hot day. Sweated my socks off, much to the disgust of the locals. Ended up putting a towel over my head as we queued in the blistering afternoon sun to go down the pilgrims steps to the foot of the big man himself. By that time, no one was particulaily savouring the sacred stairs experience. We just wanted the sticky, people-herded-down-small-stairs experience to end. The biggest Buddha in the world though? Pretty fabulous! Finally, I’m back in Beijing for my last free day in China before I hop on a flight back home for the remainder of summer. I decide to spend it getting my fill of modern art at the 798 Art District, Beijing. Unfortunately, my love for adventuring on Chinese buses (marvelling at their cheapness) means that I spend an hour getting there, while my backpacking partner takes ten in a taxi… However, I adore walking around the art district complex, it’s a very cool, relaxed space, dotted here and there with gargantuan outdoor exhibits and the odd, painted-up alley, and it certainly makes up for the time-consuming task of travelling there. Although you have to dodge the kitsch and tourist-orientated gift-shops, there are some great exhibitions on offer in the free galleries here – even the various print shops have a wealth of classical Asian reproductions on offer. It’s not as wacky as a media art gallery in Chengdu were we watched a woman vomit water, cook sushi with it and feed it to her friends – all on video, of course, so it’s art, not a nasty trick – but if there’s one gallery not to miss in 789, it’s Ullens Centre for Contemporary Art. With free entry for students, and for everyone on lucky Thursdays, it’s a gallery where you can easily spend an entire afternoon. Open Tues – Sun, 10AM-7PM (last entry 630PM). Check out my guest post Artist Profiles (2 in 1) for ‘Razz My Berries Online Magazine for a few more words on the artists featured at Ullens, Sanrath Banerjee and Wang Mai! I’m relieved I didn’t miss this last check off my China trip; as I head back on home with my (quite dirty) rucksack, it’s gained weight from its original 5kg to 10 and it’s filled with mementos, presents, clothes, and odd bits and bobs from around my travels.